What is the number one most annoying thing that a backyard birder faces when trying to watch their fabulous guests? Most bird watchers would tell you right away it is the ‘seed-stealing squirrels’. Many bird watchers complain about these little bandits gobbling up all their bird seed, chasing off their little collection of birds, and worse, sometimes destroying the bird feeder completely. Not everyone has love for the energetic and adaptable squirrel. The good news is there is an abundance of new and innovative designs for birders to use against these seed-thieves. If you have tried everything else to no avail, is it time for a squirrel proof bird feeder pole? 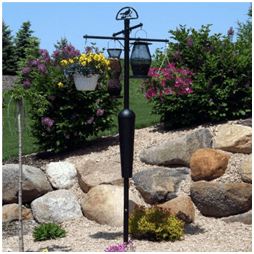 Squirrel Stopper Bird Feeder Pole System is an eye-pleasing bird feeder support system capable of stopping all squirrels! The inverted cone-shaped baffle on the pole is spring-loaded .It also moves both up and down and side to side. Squirrels cannot figure this puzzle out. The system is made of 16 gauge steel, powder-coated with a durable black finish. The Pole and Baffle set stands about eight feet tall when assembled. Try out Droll Yankees Squirrel Proof Bird Feeder Jagunda bird feeder. There is a beautiful moment to be found in the early morning hours having a cup of coffee on your porch while you watch your favorite birds nibble away. What is frustrating though is watching squirrels get fat and happy off of you continuously having to fill up your bird feeder. Your feathered friends don’t even get a chance to get close with ambitious squirrels. This is a neat solution to a squirrel problem. The Jagunda Bird Feeder features a sturdy pole which keeps the bird feeder more than 7 ½ feet off the ground, too high for squirrel jumping and the squirrels cannot reach the food from underneath. It is a Pole-mounted platform, with a hopper-style feeder which is a durable feeding tube made from UV-stabilized polycarbonate that won't turn yellow with age; The rotating port regulator adjusts seed flow for any type of seed, reducing waste. The Pole auger with lever extension arms goes in easy, stands up strong; Powder-coated, rust-resistant steel pole. Don’t worry about squirrels with this tidy bird feeder". You can find Droll Yankees Squirrel Proof Jagunda with Auger at Amazon. 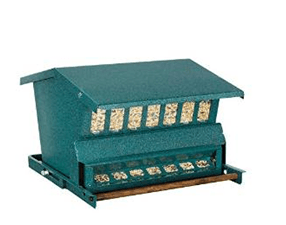 The premier Original Absolute Squirrel Resistant single-sided feeder is for the serious bird enthusiast. This attractive feeder is created with a locking top and spring-activated perch which work together to keep squirrels away. 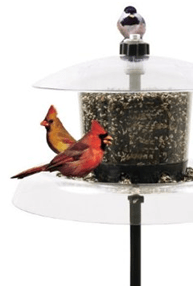 This all-metal squirrel-resistant feeder has a counter balanced perch that is adjustable to three positions to allow light, medium or heavy birds on the perch. It is through these positions this incredible design recognizes the wrong bird or squirrel immediately closes access to seed. The Woodlink bird feeder is Durable, chew-resistant green powder coated steel body with a zinc-plated steel hanger and black powder coated pole. Simply unlatch the squirrel resistant roof and lift for easy filling and cleaning. The seed level indicator window show when feeder is empty. The overhanging roof and hopper keeps the seed dry and protected from the elements and the all- steel body ensures it will withstand all types of weather and unwanted critters in your backyard for many seasons. The best feature on this birdfeeder design is the top locks down securely preventing squirrel access. When a squirrel steps onto the perch, a metal shield immediately covers the seed tray, shutting off the seed supply. Bird feeder is fully assembled, includes a steel hanging rod for hanging, and a 5 foot sectional pole kit with metal mounting bracket and ground socket for optional pole mounting. You can own this now at Amazon.